California’s Skip Phillips has been a vocal advocate for excellence in swimming pool design, engineering and construction for the past two decades – and through the past three years has pressed his point far away from home, collaborating with Canadian builder Gene Brown in producing watershapes that exemplify what he calls true excellence in construction and, from his perspective, show just how good watershaping can and should be. One of the great things about watershaping is how the work can lead you to unexpected places where you sometimes encounter vastly different ways of doing things. 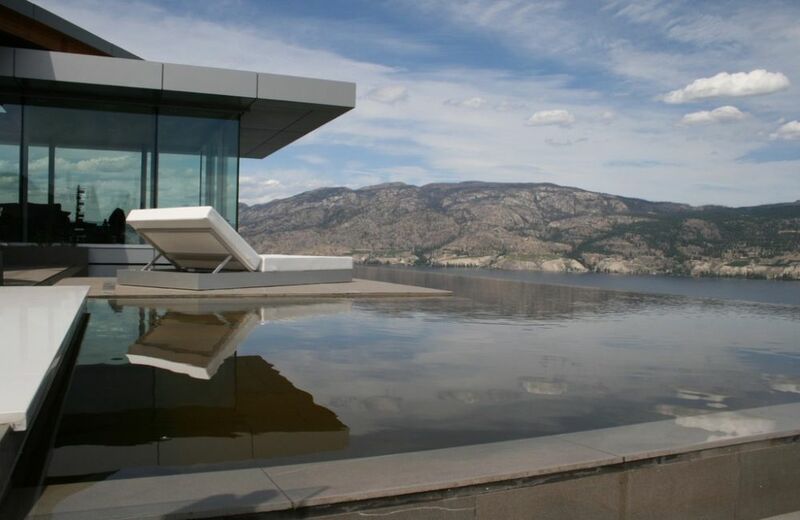 In the past few years, for instance, my design work has led me to design a number of projects in the great open spaces of western Canada – many of which have been built by Gene Brown of Valley Pools in Kelowna, British Columbia. Working with this true professional has taught me a great deal about the precision and power that comes in using poured-in-place concrete as a medium and, as a result, has greatly influenced my thinking about how watershapers everywhere should strive to elevate their own standards of construction. My northward migration began with small steps. In fact, I started off with Valley Pools simply as a consultant for hydraulic and mechanical issues, exchanging plans with Brown and helping him ensure the functionality of some of the more complex systems he found himself doing. At first, I did little more than flesh out the plans mechanically, but I couldn’t help noticing that he was finding some interesting projects – and also observed that he was one of those watershapers who had completely dedicated himself to excellence in all facets of the work. Our usual exchanges were set aside, however, when one day he sent me a set of plans that had been produced by an architect in collaboration with the homeowner: The house was extremely interesting, but the pool was ghastly – wrong in style, wrong in scale, wrong in placement, wrong in every way possible. I immediately offered to travel to Canada and revise the approach, basically because I couldn’t justify doing the hydraulic and mechanical plans while ignoring the hideousness of the design. The owner flew me up and, after we toured the site and looked at the house, I offered a set of sketches that would eventually become the pool. From that moment, I started working with Brown to create complete designs he would build for upscale clients in his region. I started making trips where we would meet with three or four prospective clients each time, and our batting average was great: Every clutch of meetings tended to result in two or three contracts. Along the way, I learned a lot about what was to me a wholly different marketplace in which homeowners tend to be less impulsive than I’ve known them to be in southern California, where I’ve designed and built pools for more than 20 years through my company, Questar Pools & Spas in Escondido. The Canadians take their time making up their minds on design details, and I quickly learned that multiple meetings can be involved before the green light flickers to life. That endemic cautiousness extends to the way work gets done in Canada: The people I’ve teamed with are extremely methodical and deeply concerned about doing things right the first time, and there’s nothing grating or confrontational about it. Through it all, everyone seems to stay gracious and forthright, and they don’t seem much interested in the sorts of drama I’m familiar with in, say, San Diego or Orange Counties. Of course there are exceptions among the clients, but I can say without fear of contradiction that Gene Brown is the perfect embodiment of this calm professional ethos: He’s careful, deliberate, courteous and committed to getting things right on the first try. It also helps that he’s an accomplished designer in his own right but has let me know that he feels more comfortable with me tackling the design work while he handles construction. The construction processes followed with poured-in-place concrete allow a measure of precision that is much harder to come by when using pneumatically applied material – a wonderful advantage when it comes to executing rectilinear designs and all-tile finishes because the walls are so amazingly clean when the forms are pulled. Personally, I couldn’t be happier with this arrangement, not only because he’s a builder of the highest possible caliber who pays the closest possible attention to the smallest details, but also because he’s a thoughtful person who sits back and listens and then asks direct, insightful questions that tend to clarify key issues. 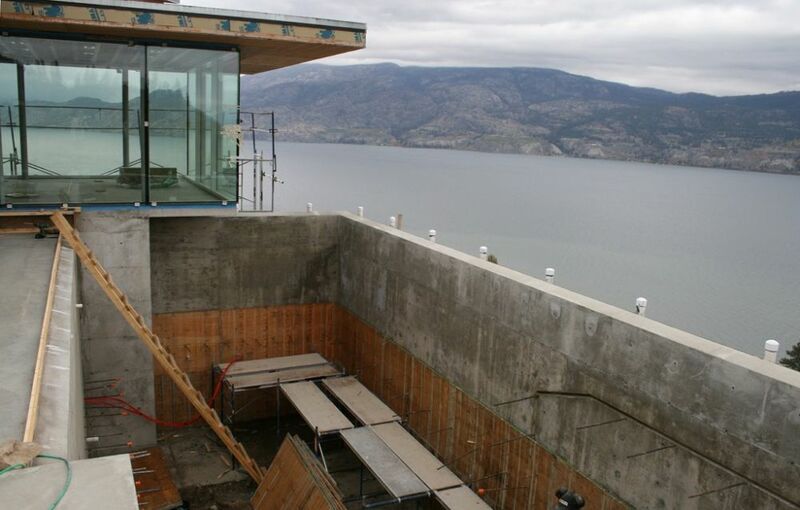 Make no mistake: As reserved and modest as Brown and many of his clients may be, some of the projects we’ve created together are anything but understated: British Columbia is a mountainous region filled with spectacular views, and a great many of the pools we’ve created have been cantilevered off steep lots and include complex water-in-transit systems. These are, in short, the kind of projects you want built only by the best of the best. The biggest revelation that’s come out of my Canadian experience has been the firsthand view I’ve gotten of what quality formed- and poured-in-place concrete construction is all about. 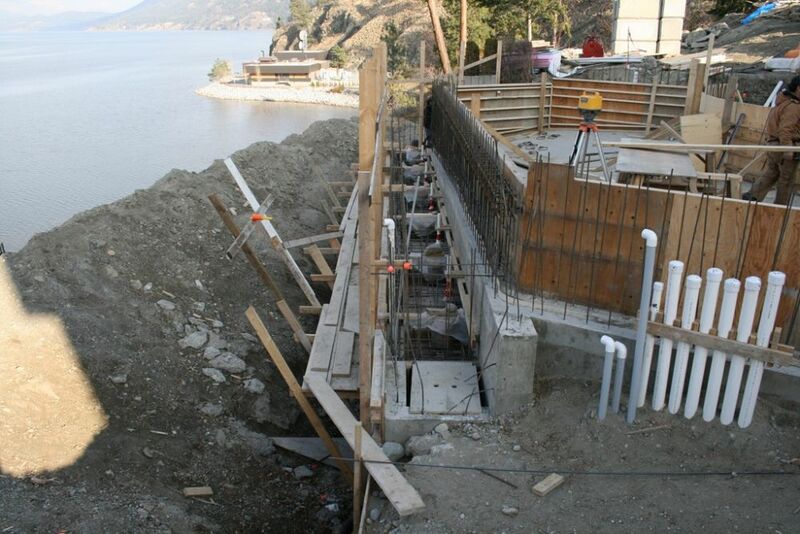 In observing the attention Brown and his crews pay to detail and the precise way they form and waterproof their shells, I must say that I’ve witnessed an entirely new and different standard of construction that exceeds what I’m familiar with in shotcrete. Indeed, his structures are built so accurately that tile installers don’t even have to float the tile to achieve perfect level – that’s how precise these structures are when he removes the forms. The only other place I’ve seen this zero-tolerance construction is in commercial projects with “tilt up” concrete structures or in freeway bridges. It’s definitely not anything I’ve ever seen with residential swimming pools! One of the key characteristics of poured-in-place structures in general is that it’s possible to achieve extremely high compressive values in the concrete. Not only are they incredibly sturdy, but they also prevent water from seeping through the concrete, essentially making them impermeable. In Brown’s case, he uses mix schedules that easily allow his shells to reach compressive strengths of 5,000 pounds per square inch or more. 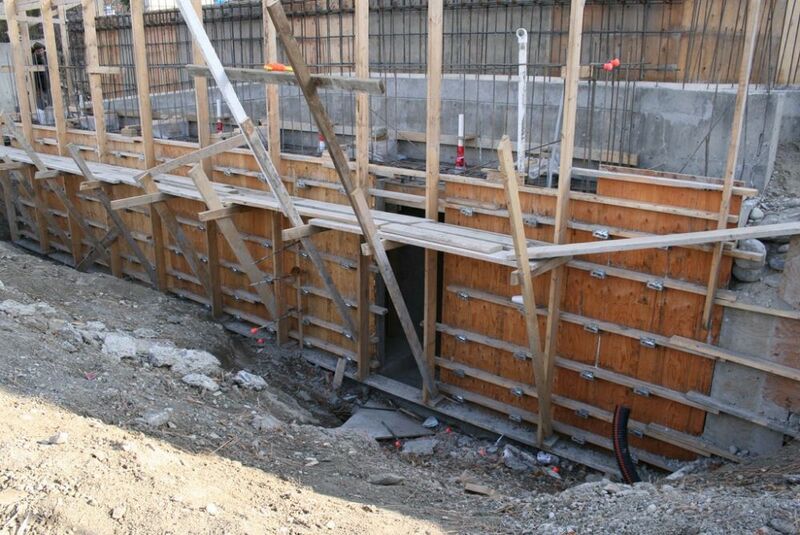 And once poured, the material is vibrated into place to achieve complete coverage around structural steel. When the forms finally come off, what you see is a low-tolerance structure that appears finished. With this sort of construction, certain issues are easy to handle. There have been situations, for instance, in which we’ve excavated to find competent, load-bearing material and have had to go down ten feet or more. Instead of having to resort to piles and grade beams, it’s not a stretch using Brown’s poured-in-place methods to decide to insert a simple room below the pool to serve as an equipment or utility room that will be as solid as a bomb shelter. The construction process entails two or more phases, depending on the structure’s design. 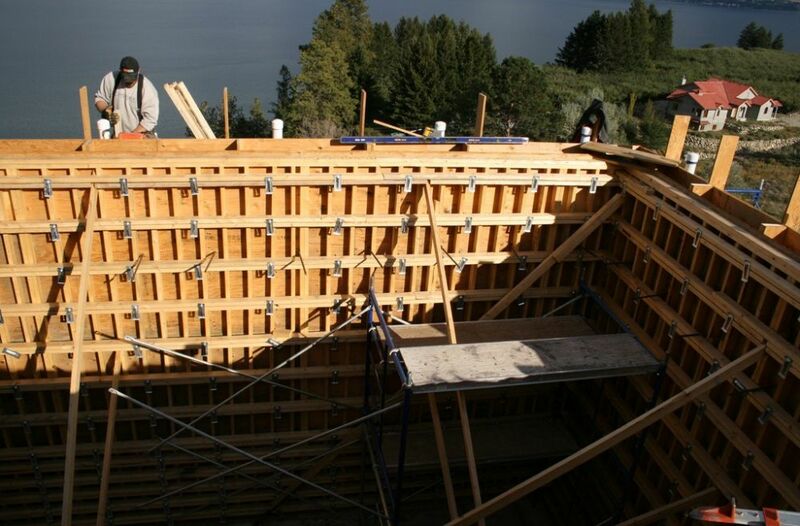 Typically, the first involves pouring the support structure and/or the pool’s floor, using the ground as the form. It’s not unusual for these floors to be two feet thick or more, largely because they need to resist damage from the freeze/thaw cycles experienced locally. With the floor in place, the crews come back and build forms for the walls. In these free-standing structures, both sides of the walls are precisely formed using sturdy plywood and two-by-four construction – which means that all of Brown’s pools are over-excavated to accommodate the exterior forms and supports and that the voids must later be carefully backfilled and compacted. Brown’s crews spare no expense and spend ample time in the forming process: Every single detail is established to the dimensions called out on the plans, with zero tolerances on all levels. 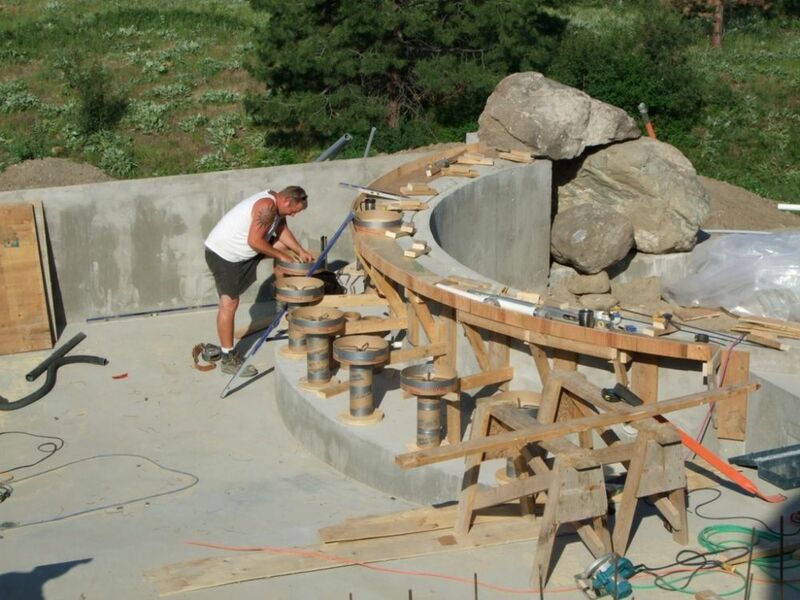 Even before the concrete is poured, the forms themselves give the impression of tremendous strength and exactitude. And when the forms are stripped to reveal that concrete shell, what you see is virtually flawless, with nothing needing adjustment or reworking. 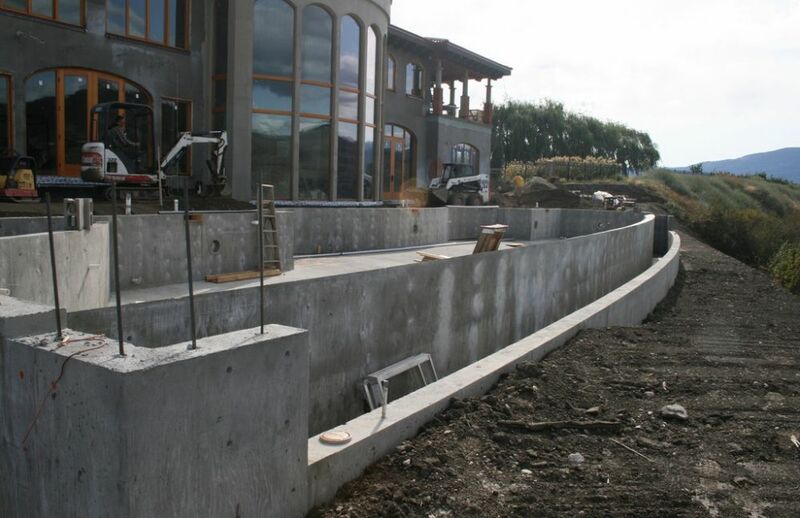 I’ve been at it for a long time, and I have to admit that I’ve never seen anything approaching this level of precision or perfection in a shell done with pneumatically applied concrete, no matter the expertise of the applicators or the perfection of the mix. In a word, it’s impressive. As a designer, I know in working with Brown that whatever I represent on the plans will be accurately built in the field. I can’t tell you how liberating and encouraging that is when it comes to specifying such details as perimeter overflow gutters or vanishing edge dam walls or catch basins or steps or shallow lounging areas – features that almost all of my projects with Brown have included because I know they will be built correctly and perform as required. Through the years, I’ve spent a considerable amount of time acting as an expert witness in lawsuits over failed pool structures. In many of those cases, I’ve observed that the design and plans are fine but that the builder has failed to construct the shell accordingly and that the level of workmanship has at times been truly appalling. In working with Brown, I rest assured each and every time that those sorts of worries are as remote as can be. And where his skills free me up to design as I see fit and the site requires, what I appreciate most of all is the intellect he brings to the process and the degree to which he thinks things through in detail and anticipates and accommodates issues before construction begins. Most of the projects we’ve done together have been contemporary in terms of design, basically because so many of the architects working in the area are modernists who prefer to work in rectilinear forms. But when a pool design calls for sweeping lines and complex radiuses, I’ve found that Brown and his crews are more than up to the challenge and accomplish the contours we’re after with unmatched precision. As a designer, I’ve come to enjoy the freedom and confidence that poured-in-place concrete gives me, especially when the material is managed by crews that know what they’re doing. I can be as creative as can be in working with my clients, secure in the knowledge that what I put into my plans will ultimately appear on site – just as the clients and I expect. In fact, it’s apparent that he loves a good challenge: We recently completed a project, for example, where the pool shares one of its walls with the foundation of the house – a detail that can only be achieved with near-zero-tolerance construction and, it goes without saying, superb waterproofing, which is another of his valuable strengths in an area where the ground freezes. Obviously, I’m tremendously impressed by the standards Brown and his crews observe at every turn – so impressed, in fact that he’s made me an advocate for applying this level of quality to construction throughout the industry. Nothing Valley Pools does is beyond the ability of most companies: It’s all about investing in skills development and in finding people who share a desire to do the best work possible at the highest level imaginable. In simple, practical terms – and again drawing on my experience in courtrooms – just consider the reduced exposure the lawsuits, the increased level of client satisfaction, the greater serviceability and longevity of the product: In my book, those all point toward a much more successful industry in the long run. On another level, I’ve found that working in this way is infinitely more satisfying to me as a professional. I’ve always been proud of my work, but I find as I spend more time collaborating with Brown and Valley Pools that I enjoy even more the prospect of pursuing excellence in design knowing I’ll be turning my plans over to professionals who embrace excellence in construction. All that, and I get to spend time in a beautiful part of the world as well. Skip Phillips is president of Questar Pools, a pool design/build firm based in Escondido, Calif. With more than 35 years’ experience in the pool industry, he has worked tirelessly to elevate pool design to an art form while building an international reputation for excellence and innovation – particularly with respect to vanishing-edge pools. Phillips started his business in 1975 as a service/supply/repair operation and moved quickly into renovations and new construction. 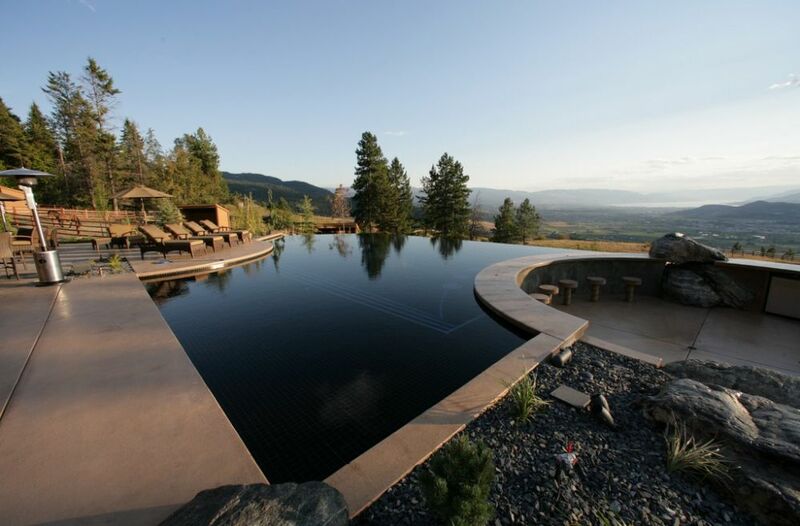 In 1998, he was a co-founder of the Genesis 3 Design Group, a professional community dedicated to education and excellence in pool design, engineering and construction. He has won more than 100 local, national and international design awards; has had many of his projects published in books and magazines; once served as president of the National Spa & Pool Institute; and has been an expert witness in hundreds of cases related to workmanship and standards compliance.